Here are just a few of the phones that became current in the immediate post-liberalisation era. . 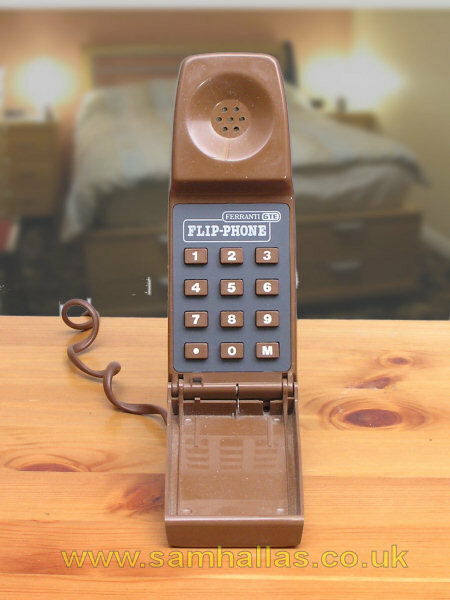 The GTE Flip-phone was one of the early imported phones on the British market. Made by GTE in Brazil, it was badged Ferranti-GTE for the UK. This is a loop-disconnect model. The miniaturised electronics were presumably rather fragile, as one in my collection stopped working. I gave it to the son of the designer Michael Taylor, Rob (now Rob Dunsford), who requested it as a souvenir of his late father. 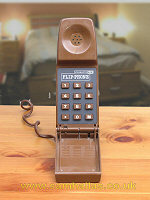 The other one was my bedside phone until it too stopped working in 2010. 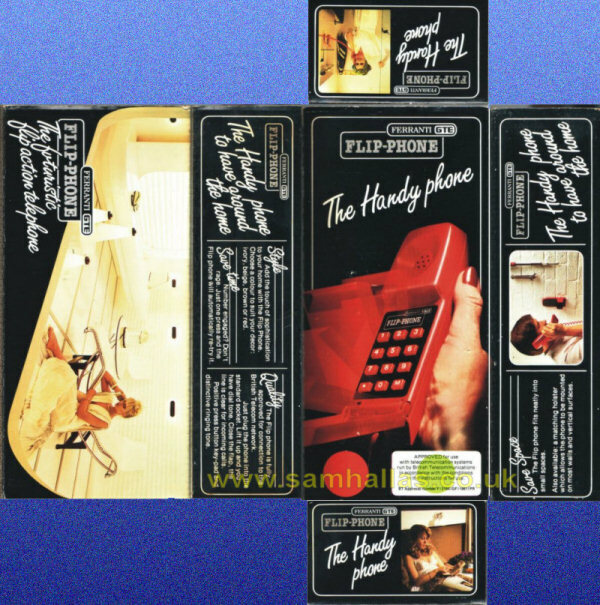 The Flip-phone fits into a neat holster which can either sit on the table, as on the right, or be fixed to a wall. I had a red version, still in its original display box - box folded flat. Pity it didn't work either. I've since given it away to another collector. 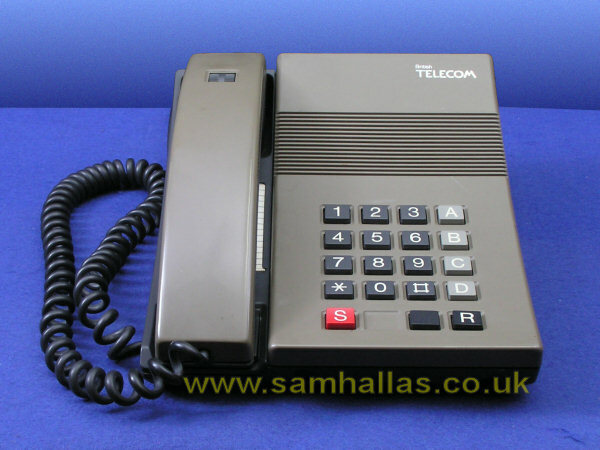 Dating from just after liberalisation of the telephone instrument, BT offered Telephone Number 9701 design from Northern Telecom (now Nortel) under the marketing name of Tremolo. It uses an electret microphone and has an adjustable sounder. This model is loop-disconnect only. Read the User Guide in the Document Repository. 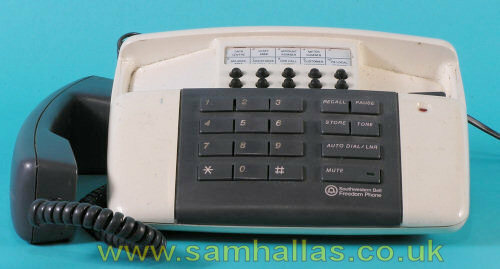 Southwestern Bell imported a whole raft of telephones of varying quality and design. 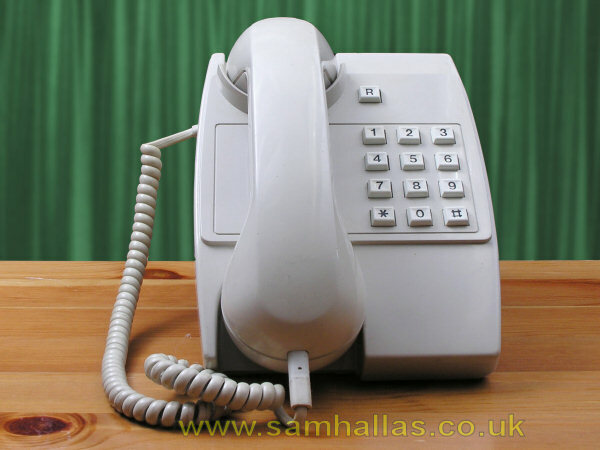 The Freedom phone shown here is reasonably stylish, but the whole range suffered from poor immunity to interference. A style classic, designed for Standard-Electric Kirk by Jacob Jensen in 1976. Imported by STC but marketed by BT as Loudspeaking Telephone No 10. Fully hands-free operation with volume control on the handset, behind the receiver. The concave front can be replaced with one of a different colour to match your mood or interior design. 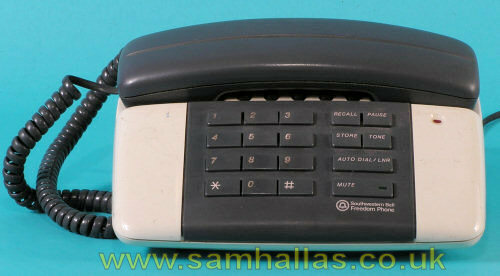 Separate models were produced in pulse and tone dialling. Both types had all sixteen keys, though the ABCD buttons are ineffective on this pulse model. A rather bulky offering from BT. 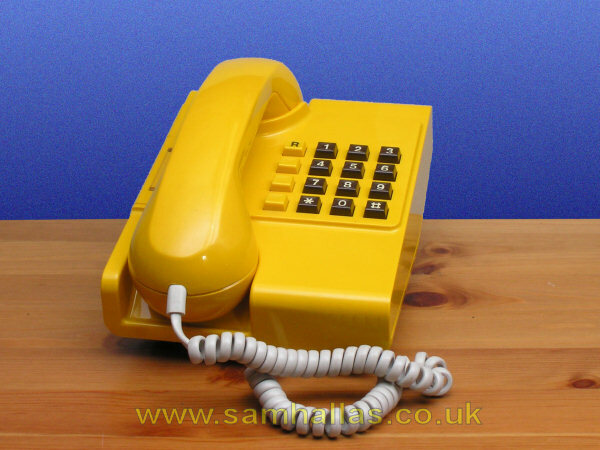 The Ambassador, Telephone Number 8300, came in a range of colours including this Sunshine Yellow, the same colour as Buzby the canary used in BT's advertising at the time. 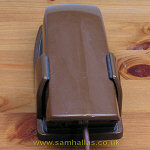 The first to be designed specifically for the new style plug and socket. It was never a great success and was soon eclipsed by it neater successor, the Statesman below. 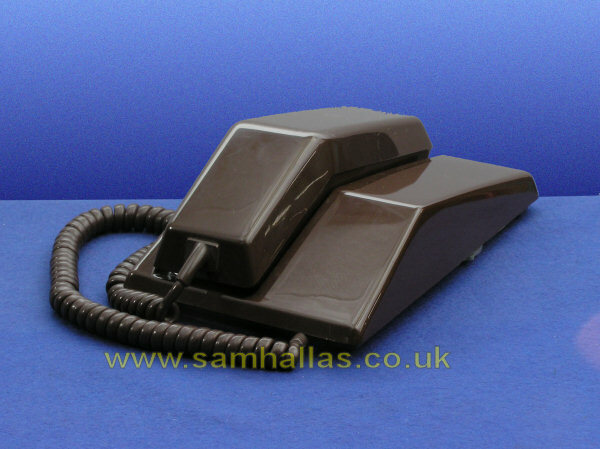 However, the case design was the basis for instruments used with the Ambassador and Senator key telephone systems. The Sceptre, Telephone No 10001 was designed by BT engineering staff, but contracted out for manufacture. The Sceptre 100 on the left was only available in a loop-disconnect version. This one was made by Dennis Ferranti Meters. The Sceptre 101 on the right was made by Austin Taylor. Much lighter in construction than the Ambassador above. This model, Telephone number 9401AR was possibly one of the first telephones to use the miniature Bell 84 to give a real ring. This one was made by TMC in Airdrie and marketed by BT. The Tribune looks as if it ought to have a carrying handle below the handset, but annoyingly it doesn't and I end up lifting the handset off hook. 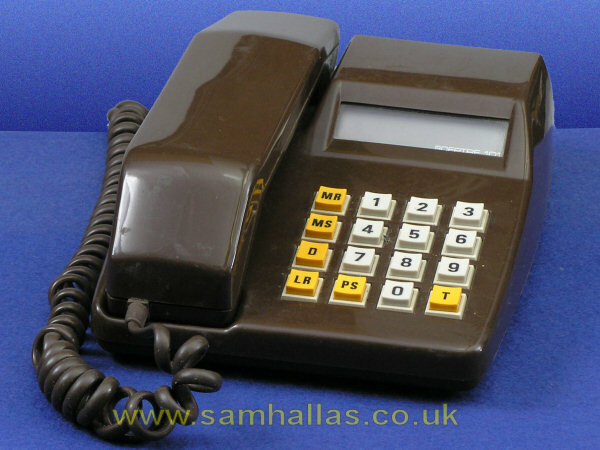 Using the same handset No 16 as the Ambassador above, the Statesman, Telephone number 9101, was a much more successful design with its smooth, low profile. The electronics use integrated circuits to give a very compact layout. 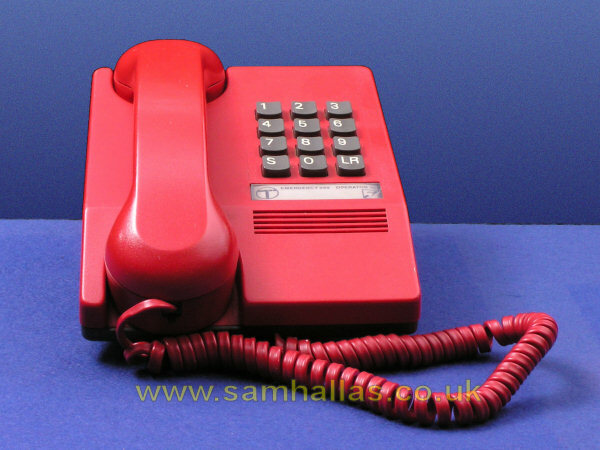 Manufactured for BT by all three major suppliers, who also produced proprietory versions - see the Corporate Phones page. The Statesman is also the subject of my first 'Take a Phone to Bits' project..
BT has always taken trouble to cater for users with disabilities. 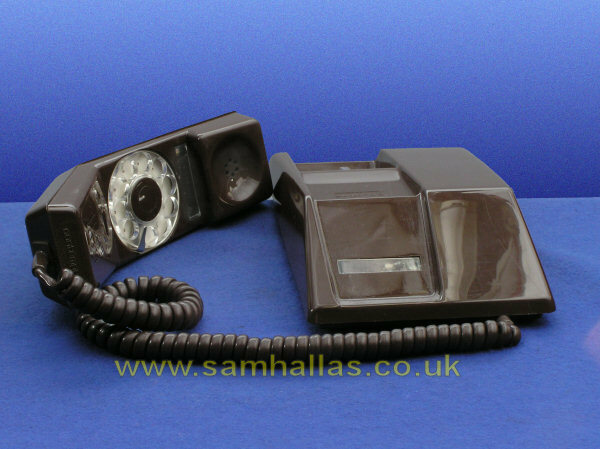 The BT BigButton telephone commissioned by BT proved commercially successful both for users with sight and movement impairments and with others, who just liked its chunky design. 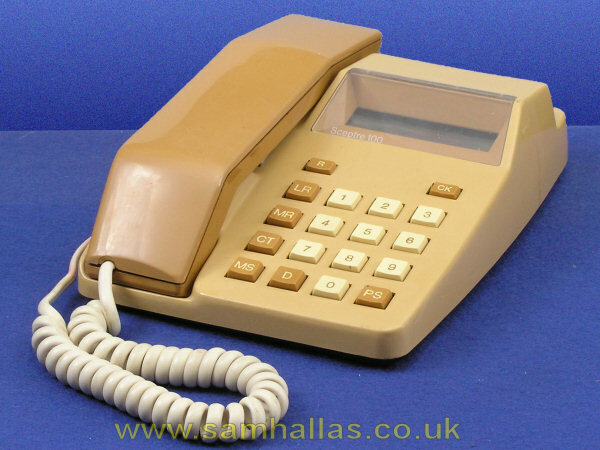 This one is switchable for pulse and tone dialling and has three memory buttons and a calling lamp indicator. It has the ability to amplify incoming or outgoing speech, though not both at the same time. It's a pity this one didn't work. The design has stood the test of time and was still in the range when I checked in 2010.